While most summer activities are meant to be enjoyed outside, sometimes the warm weather can be too hot to handle. The entire Midwest is suffering a heat wave, and temperatures are skyrocketing to dangerous heights. During a heat advisory, the best place to be in indoors. Take a look at our suggestions for fun things to do! The Normal Theatre shows classic, independent and world cinema films on the big screen. It also has a delicious snack bar! To see their screening schedule, click Here. With 23,000 square feet of indoor trampolines, Altitude Trampoline Park has plenty of room for you and the kids to let loose! Activities include extreme dodgeball, monkey bars, trapeze and basketball. Both the Bloomington and Normal Public Library offer summer programs for kids and adults, including book clubs and craft activities. The libraries don’t just offer books to check out; they also have audiobooks, CDs and DVDs. Have an interest in history, Abraham Lincoln or Route 66? BN has the museum for you. The McLean County Museum of History, Prairie Aviation Museum, David Davis Mansion, Children’s Discovery Museum and many more are waiting to be explored. Most of the art galleries in town are within walking distance from each other in Downtown Bloomington. 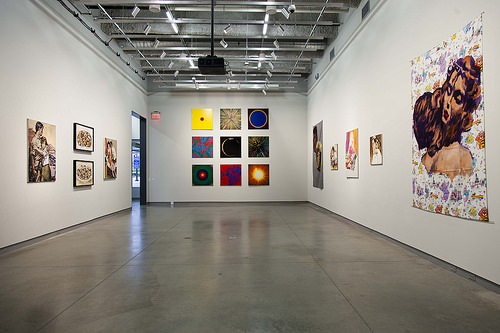 You can take our self-guided art gallery tour by downloading the map in our “Individual Tours” section on our website.